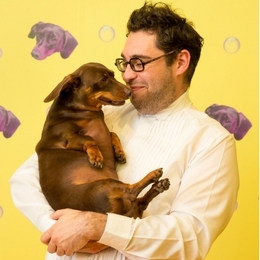 Performance artist David Capra collaborates with his dachshund Teena. Teena is quite the publicity hound; in 2016 she launched her own fragrance, Teena’s Bathtime: Eau de Wet Dogge appearing on the 9 Network’s Today Show whereby TV hosts Karl Stefanovic and Lisa Wilkinson sampled the scent on a special ‘smell-o-vision’ segment. In 2014, Teena’s Bathtime was launched at the Museum of Contemporary Art’s Bella Room, an experiential space designed for people with specific needs. The work drew upon their interest in animal assisted therapies and focused on the act of giving Teena a bath, featuring a room-size zigzagging sculpture of the dachshund. Teena doesn’t quite enjoy bathtime so the work became a helpful tool to openly discuss mental health.